If you are a Woman of God, the Bible is very clear about the type of woman to which you should aspire. I should think that every man on the planet would be trying to find one of these, but sadly they are not. To become such a woman would not be a simple task, but I have known many in my life – elderly women who have let the fires of life shape them and burn away impurities, and who have embraced the love of Christ so completely that He is reflected in all they do. How often do we go before God with a list of petitions as if He is a benevolent Santa Claus waiting to give us anything and everything we ask for? It is true that He hears and answers our petitions, but not all of them the way we think is right, or not the things we want every time. If we took time out to THANK GOD for all the things He has already done in our lives, our prayers could go on for a very long time without asking Him for anything. 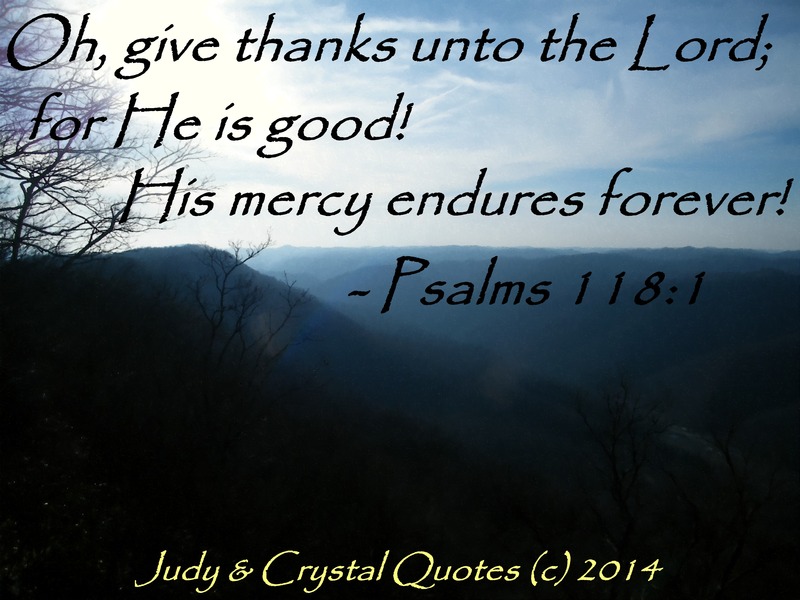 Taking time to thank God for His mercies and blessings will also put our other matters in perspective. Often, when I begin to thank God for His goodness, the thing I thought I needed to pray about fade into the background. There are times that what I had wanted to bring before God as a request become a prayer of thanksgiving in advance. 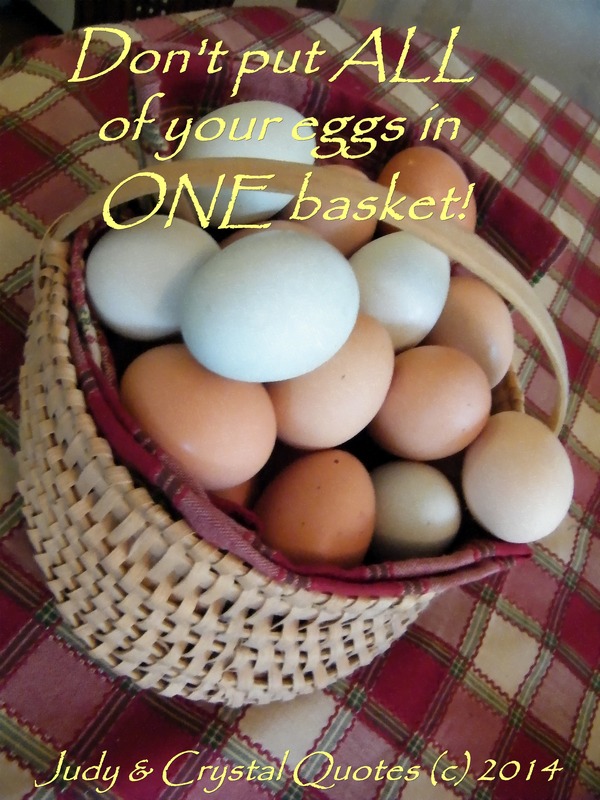 I didn’t realize eggs came in so many different colors until a friend picked out a couple of dozen for me from her own little flock of chickens. It was an amazing discovery. Eggs are such a vital part of the human diet. Fried, boiled, broiled, sunny side up, deviled, sheered, or scrambled – eggs are a treat. Almost all baking recipes need eggs to help firm the ingredients as they bake. I think the saying could also be interpreted to mean that we should have many interests in life. We need to develop our spirit, mind, and body and find ways to grow in all of those ways. We all have more than one gift but many of us fail to develop even one to its fullest potential. I love sunshine. 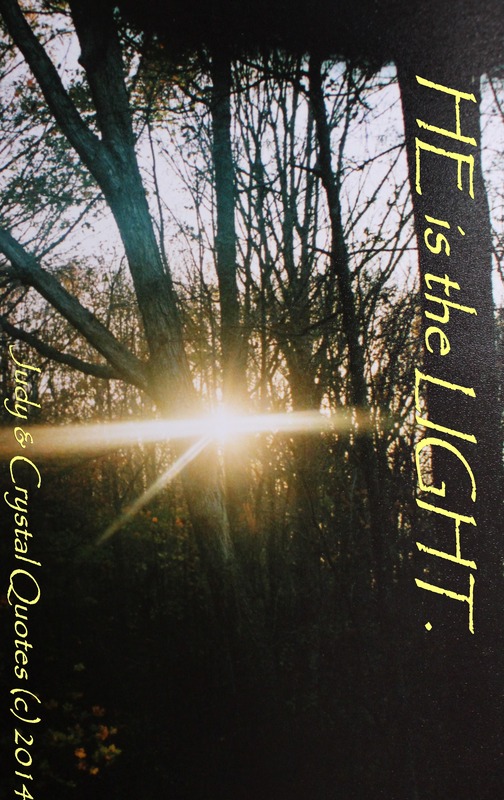 As the days are lengthening, I can already feel my attitude lightening and my strength returning. We have had a long, dreary winter and everyone I know is looking forward to springtime and longer days. A lot of people have a love vitamin D level and the short cold days of winter don’t help. This summer I would like to find a big flat private rock in the sunshine and lay out on it like a big lizard soaking up the rays! It is hard for me to understand people who love the night and seem to come alive when the sun goes down. That is their privilege, but for me sunset marks the end of my productive energy for the day – like housecleaning. I have friends who say they don’t even start cleaning until after the sun goes down. It seems to me that most mischief goes on in the darkness, as well as crimes. I can’t think of anything I enjoy doing that happens in the black of night. One description I have heard about Heaven and Hell is the presence or the absence of light. To be in the presence of the Lord is to constantly be in the warmth of His love and the light of His glory. This is Heaven’s promise. Hell, on the other hand, is described as outer darkness, forever separated from God and forever without the joy of light. An eternity of darkness seems like a terrible thing to me. I am always concerned about knowing what God wants me to do and doing it. I have spent a great deal of my life afraid of missing God’s will or settling for less than His best plan for my life. Part of that comes from having fallen in love with a young man in college that I truly thought was God’s match for me, only to have him prove untrue after we were married. I wanted so much to do God’s perfect will even way back then. I asked her to repeat it for me a couple of times. 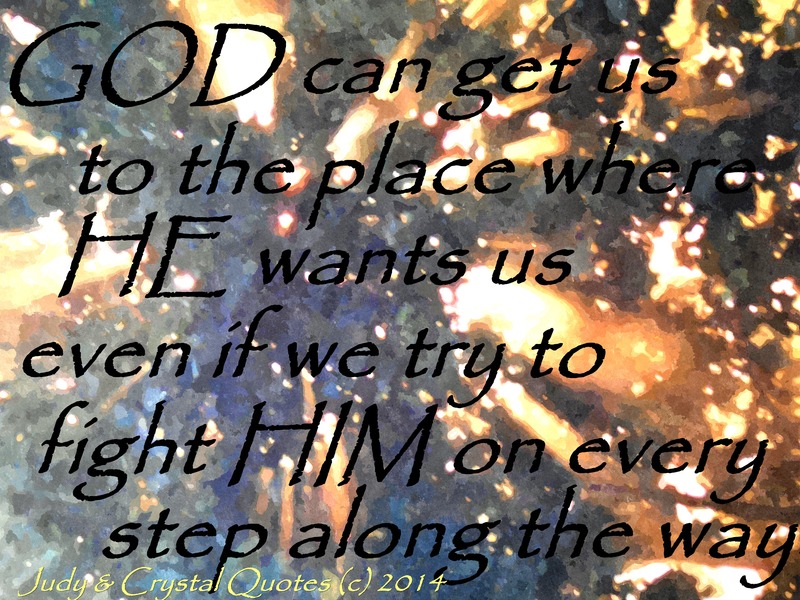 If God can take people where He wants them to be, even though they are fighting against Him, then surely He will take us to the place He wants us to be if we are asking Him to do so and desire it with all of our hearts. We put way too much emphasis on ourselves and our efforts. We live in fear of failing the One who never fails us. Surely this is not the relationship God wants to have with us. Where He leads, I will follow. His Word is a lamp unto my feet and a light unto my path. It always bothers me when I hear people talk about God as if He is some cruel taskmaster sitting on His throne in heaven, just waiting for us to mess up so He can crush us. I’ve read/heard that people perceive God to be similar to their biological father. If their father was absentee, uninvolved, and indifferent, this is how they think God will be in their life. If their father was brutal and physically violent toward his family, these are the people who think God is just waiting for a good excuse to squash them. I am thankful that I had a dad who was gentle and loving. He wasn’t afraid to spank us if we needed it, but he loved us constantly and provided for our spiritual and physical needs. I, therefore, see God as a loving father who is involved in our lives and wants us to be happy and healthy. Fathers have such a huge opportunity and responsibility to influence their families as a God appointed head of the household who has more impact on his family’s life than any other man. I believe that God enjoys preparing surprises for us along the way. A hidden flower, a gorgeous sunset, a gentle breeze, or a flaming leaf all speak to me of God’s goodness. 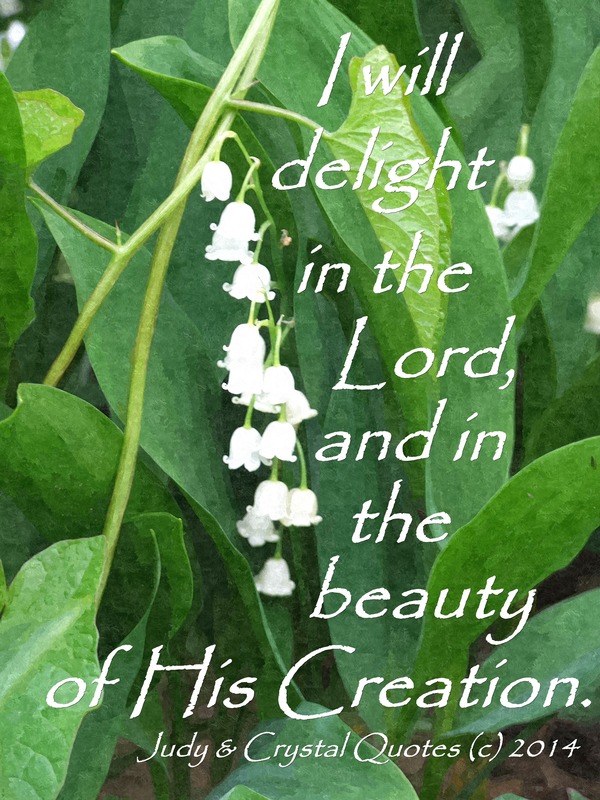 I delight in the Lord, in His love, in His plan for my life, in His goodness, in His tender mercies. 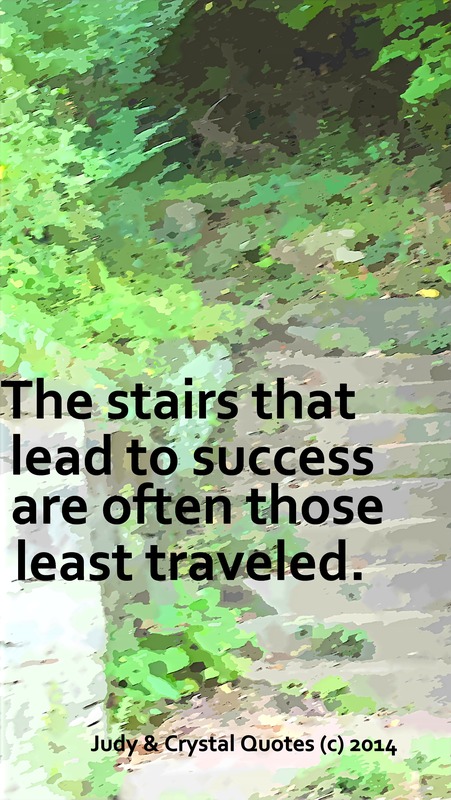 If the stairway to success was clear and uncluttered, people would trample each other trying to get to the top. If there was no work involved in getting there, hordes would be pushing upward all the time. Success has many definitions and varies from one culture to another and even one family to another. I am finally old enough to realize that it is perilous to try to measure our own personal success by anyone else’s yardstick. The path to success is one that is among the least often used because of the clutter and obstacles that seem to block the way. Not knowing exactly what things are going to look like at the top causes a lot of people to never even start the journey. There are many more promises and bits of wisdom in the Bible about being a success. God wants us to succeed. He wants us to be the best we can be. He equips us with individual gifts and unique life experiences to shape us into human beings with the potential of great success in whatever circumstance we find ourselves. I don’t have to be the best Billy Graham in the world. I don’t have to be the best Corey ten Boom there could ever be. I only have to be the best me that God created me to be. That is the true measure of success. Photography is Sometimes Pure Dumb Luck! I try to keep a camera with me at all times. There is one in my purse, my car, and my house. It is hard to tell when a photo opportunity is going to surface. I thought about what to write with this picture, but I think it says more than I could begin to say. 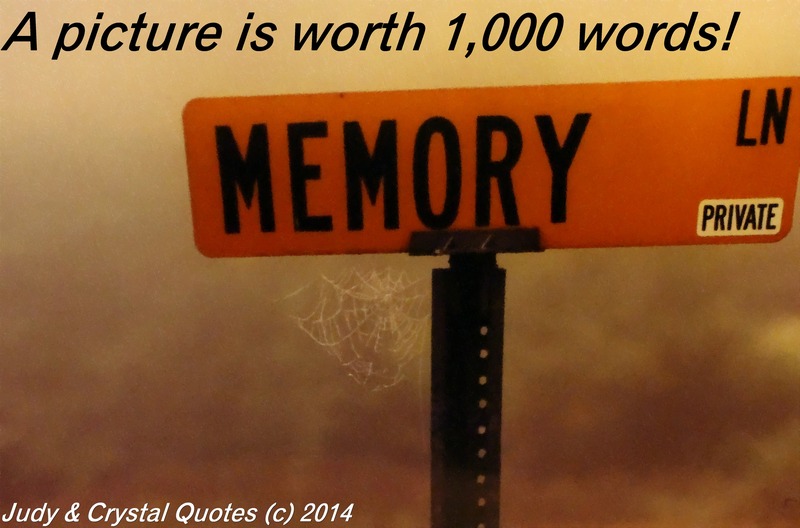 Memory Lane covered in spider webs, with a private sticker… I couldn’t have made it up and had it be any better! Some days, the best shot is just keeping your eyes open, having a camera available, and pure dumb luck! I am not superstitious by nature, but I do pay attention to circumstances. I have also collected superstitions from the region of the country where I live. Some people make their daily decisions based on “signs.” I caught a falling leaf, so I will be getting a letter in the mail today. A bird got in the house and that is a sure sign that someone in our family is going to die. The wooly worms are black, therefore we can expect a hard winter. Some Christians run their life the same way. They are constantly looking for signs from God about the petty little decisions they have to make every day like what to wear, or whether to go to the grocery store or not. Should I turn left at this corner or go right? Life can be very confusing. 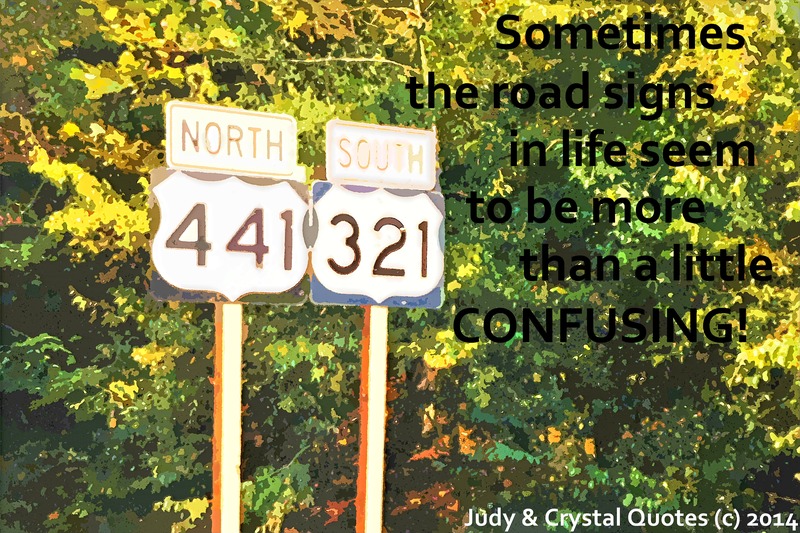 Even when we want to do the right thing or go in the right direction, we may be getting mixed signals and remain uncertain. I don’t think God wants us to deal with life by constantly looking for signs or trying to spiritualize every little thing. I think He wants us to know Him well enough and have a sound relationship with Him to the point that He is directing our paths, even when we don’t realize it step by step. We humans tend to think that it is all up to us, to our intellect, to our logic, or to our ability to see signs from God. The truth is, God wants to communicate with us and He is perfectly willing and able to give us clear direction about our decisions and directions for the future – whether He reveals Himself to us through the Bible, speaks peace to our hearts in the right decision, speaks through other people, or actually speaks to us in one way or another. There is nothing quite like the scent of a skunk. They can be smelled long before they are seen. No other creature on earth of which I know carries the pungent repellant sprayed by skunks. On a recent drive through Kentucky along a rural road, I counted twenty two dead skunks before I stopped counting, and smelled the potency of every single one of them. It seemed like every skunk in the state must be trying to cross the highway on the nights of February’s full moon. Skunks are only found in North and South America. They are easy to recognize not only by their smell, but also by their black and white markings. They eat animals and plants, may hibernate through the coldest part of winter, and bear young in the spring. They are nosey little creatures, which may be part of what causes their problems on the highway. Like humans, apparently they want to know what is on the other side. They may be searching for food after the winter thaw, or maybe looking for a mate. I was once photographing a skunk (maybe the one in this photo) at Cumberland Falls. It was coming up a forest path toward me. I took a few shots then hid behind a tree, trying to let it get closer for a better photo. I leaned out to see where the skunk was and it was no longer on the trail. I felt something at my foot and looked down to find the skunk sniffing my toes. Needless to say, I did not move, and eventually, the little guy lost interest and waddled away. It was so close, my camera wouldn’t focus on the settings I had used for the trail and I couldn’t manipulate the camera without disturbing my little visitor. Lloyd Dodgett said, “Sometimes when you get in a fight with a skunk, you can’t tell who started it.” The end result is still the same – the stink is all over everybody/everything. Drawing a comparison between people and skunks is pretty easy. Some people are just plain stinkers. They are always up to something, always offending people, and always causing people to try and get away from them because of their whining, grumbling, and general bad attitude. 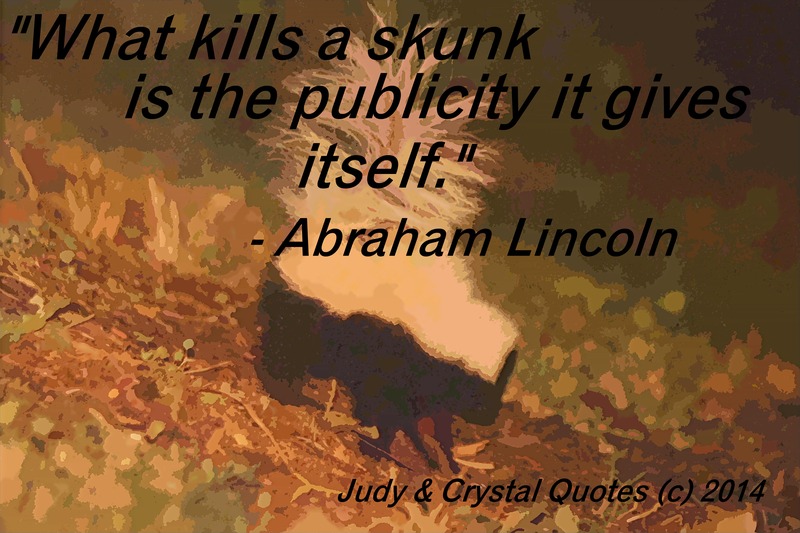 Skunks earn their reputation because of their behavior and the stink they leave behind if they have felt frightened or threatened. Maybe people stir up stink around them for the same reasons.